Breakfast is by far my favorite meal of the day as it acts as the foundation of your day. 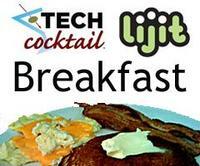 A few weeks ago Lijit Networks hosted a breakfast the morning after TECH cocktail DC 2. It at Busboys & Poets in Washington, D.C. and was a lot of fun. I got a chance to capture episode 24 of SOMEWHAT FRANK TV.